The specified file public://inline-images/papadopoulos simona.jpg could not be moved/copied because no file by that name exists. Please check that you supplied the correct filename. Special Counsel Robert Mueller threatened to charge former Trump campaign adviser George Papadopoulos as an unregistered agent of Israel, according to his wife. Simona Mangiante Papadopoulos, an Italian attorney who married Papadopoulos roughly 90 days ago, claimed that Mueller had evidence her husband had worked on behalf of Israel without registering as a foreign agent during his time as an energy consultant, and prior to joining the Trump campaign. The claim was made in interviews with the Daily Caller and the Washington Post - where Simona also said George Papadopoulos pleaded guilty to avoid the Israel-linked charges. In October 2015, Papadopoulos wrote a column for the Israeli publication Haaretz entitled “Natural Gas Isn’t Just about Israel.” He also attended a series of energy conferences in Israel, including one held in April 2016, just days after he was named to Trump’s campaign, according to Israeli media accounts. Simona's new claims are vastly different than what she said in January before she and George married - when she suggested to the Washington Post that Papadopoulos would be remembered like John Dean, the former White House counsel who flipped on Nixon's administration and became a key witness. On Tuesday, however, her tune had changed - saying that her earlier comments were misinterpreted and that she and George had reassessed events after learning that Cambridge professor Stefan Halper had been conducting espionage on the Trump campaign for the FBI. Halper hired Papadopoulos to write an energy paper in London in the fall of 2016, paying him $3,000 for his efforts. Before joining the Trump campaign in March 2016 as a foreign policy advisor, George Papadopoulos lived in London, working as a researcher for the Hudson Institute think tank, and later as an independent energy consultant. Despite his work on Israel, Cyprus and Greece while at the Hudson Institute, a person familiar with the Institute told the Washington Post that nobody from the Special Counsel's office has ever contacted them regarding Papadopoulos's work there. Meanwhile, it was Papadopoulos' May 10 alleged "drunken barroom admission" to former Australian diplomat Alexander Downer that the Russians had information which "could be damaging" to Hillary Clinton. Papadopolous was originally told of the allged Russian plot two weeks earlier on April 26, by Maltese professor Joseph Mifsud (missing since October 2017) - whose organization George Papadopoulos met his wife through. Simona Mangiante first connected with Papadopoulos on LinkedIn after Papadopoulos noticed they shared a mutual connection. 2. That connection was Joseph Mifsud, a most mysterious former Maltese government official who ran an institute called the London Centre of International Law Practice in Britain. THE Joseph Mifsud now made infamous by her husbands indictment by Robert Muller. 3. Mangiante, started working at the organization after meeting Mifsud while she was employed at European Parliament in Brussels. Papadopoulos, who had worked for Mifsud’s organization as well, reached out to say he liked her profile picture. 4. Mangiante left the London Centre of International law after three months, after concluding the law office was “a facade for something else.” But the two continued to talk over the Internet, before meeting in person for the first time in New York in spring 2017. 8. in September 2016, Mangiante received a message on the LinkedIn social network from George Papadopoulos. Papadopoulos had worked at the same London Center of International law centre briefly before joining Trump’s campaign. That was the beginning of their acquaintance. 9. It appears that Mangiante started her job around September 2016, the same time as she started corresponding with Papadopoulos. Mangiante was not happy with her work in London. 12. Prior to meeting Mangiante, FBI had interviewed Papadopoulos Jan 2017 in connection with the collusion investigation. Papadopoulos gave federal agents a false account of his meetings with Mifsud. So he deleted his Facebook account and changed his cellphone number. 13. 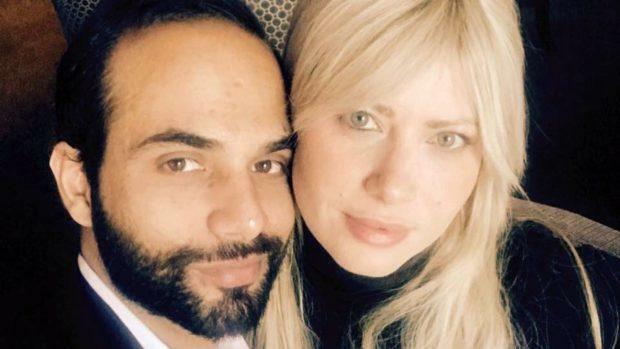 So almost 3 months prior to Papadopoulos actually meeting Mangiante he was already in the crosshairs of FBI, he was deleting facebook, changing phone numbers and like James Bond, was actively romancing a beautiful woman. Plausibility check # 1, what do you think ? 14. On the day Papadopoulos pleaded guilty, Mangiante was at her boyfriend’s family home in Chicago. There was a ring at the door. A casually dressed man informed her that he was a federal agent. He was serving her with a subpoena from Mueller. 16. Plausibility check # 2. Do you think about how much lawyers cost when the FBI tells you that your boyfriend is chin deep in legal manure and you may be too? Stormy Daniels gets a lawyer for free, but someone being investigated by the FBI thinks about a lawyers cost? 18. Mifusd's interest is piqued when he learned that Papadopoulos was going to be involved with the Trump campaign. They meet again subsequently in London on March 24th 2016 when Mifusd was accompanied by the "Putins niece" Olga Vinogradova, who like Mifsud has now disappeared. 19. Papadopoulos met Mifusd again on April 24th 2016 for breakfast at a London hotel. This is the first time that Mifsud tells him he knows the Russians have "dirt" on Hillary. Mind you the DNC leaks weren't published till June/July 2016. Important point right there. 22. and if he did, he would have known Mifsud from his work, so the whole theory of his being introduced to Mifusd falls flat. 23. The BIG question: by the time Papadopoulos began corresponding with Mangiante in Sept 2016, he was a part of the Trump Campaign, what was he looking at LinkedIn profiles of people working at the London center of international law for? What am I missing here? 24. I have more questions than answers, but the timeline just doesn't add up, there is a lot missing here apart from my functioning neuronal circuitry. All of this is important in the context of Mangiante's recent media blitz and her asking for Trump to pardon Papadopoulos. 25. Feel free to add to what I have just outlined. Things are not only a little askew here but seems that we are seeing this whole matter askance and many facts are obscured by layers of hearsay disguised as factual information. -fin. 26. Addendum: anybody else find it most peculiar that Mangiante worked for Italian and German social democrats? Especially now that we know that MI6 (Downer/Steele/Halper) were probably involved with the genesis of the Steele dossier? 27. Mifusud appears to be more aligned with the UK than he is with the Russians, Mangiante herself said so. Also she has since dialed down her touting of her husbands role in the Trump campaign, why? Questions? An even deeper analysis into Papadopoulos and Mifsud can be found here.